I'm the Star of HP's Latest Banner Ad! As I was looking at who was looking at my profile on LinkedIn, Doubleclick was “looking” at me and serving up a very personalized ad. The ad was about me and my network of trusted professionals. 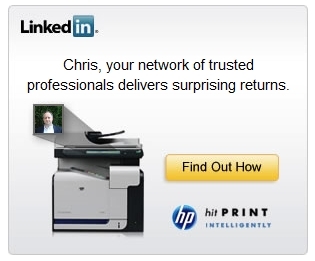 It even included my LinkedIn profile picture rising off of their latest printer. Personalized targeting and re-targeting are continuing to gain ground. More companies are targeting consumers based on their online behavior. 24% of online marketers used behavioral targeting in 2009, up 50% from a year earlier, according to a Forrester Research Inc. poll. I recently purchased a Droid X and I’m beginning to see some personalized targeting efforts within some of the games and apps I’ve downloaded. So, will this cause banner ads to increase in their importance for marketing folk? Will the end consumer/target find them “creepy”? Will the be perceived as a violation of privacy? How many opportunities have we missed because we were too busy and didn’t “engage” someone? How many sales have been lost because we didn’t just answer the phone? How many new clients slipped through the cracks because we didn’t answer an email or didn’t answer it soon enough? Over the past couple of years I’ve been doing some straw polling of friends and business partners when it comes to “engaging”. What I’ve discovered is that the vast majority of company’s are seemingly too busy to engage their current customers let alone new, potential, customers. I have heard over and over from people – my customers and others – that we got the business or they got the business just because someone picked up the phone and talked to me. How are you engaging with your team? With your customers? With your potential customers? nation’s first heating and cooling service company to offer on-time service. don’t pay a dime”. They risked material wealth to build credibility. wannabees. What’s your expertise? How can you highlight it? tackles with a great story about identity protection specialists Lifelock. are your company’s defining characteristics? signals do you decisions send? there conflict between what you are saying and who you are being? that buy Credibility is a book that will be a perennial read for you. In my hometown of Kernersville, NC old school marketing has collided with social media and is putting a local business on the map. Part one – The man is Kenny (seen in the photo), his method – dancing with a sign on one of the busiest corners in town. Kenny's employer, The Vault, found him dancing on a corner in a nearby city several months ago and offered him a part-time gig. Kenny proved to be a huge traffic driver with 1 in 3 customers coming through the doors saying they came in after seeing Kenny bustin' his moves on the corner. Needless to say Kenny is now a full-time employ of The Vault. Part two is what all marketers love – the tribe rallying and spreading the word. Shortly after Kenny started dancing at the corner of Main St. and the on ramp to I-40 a passerby snapped a photo – drove home and started "the guy dancing outside of The Vault in Kernersville" fan page on Facebook. In less than two weeks the page grew to over 3000 fans and today is just under 4000. This is a great example of how one of the oldest marketing methods is still viable and attracts so much attention that people can't help but spread the word through new marketing channels like Facebook. What do you think? Have you found successful ways of integrating old and new methods? Tom's definition of each currency frame the rest of the book and bring a clarity to how we can put into place programs, processes and policies that increase our credibility. Today's focus is on the first – material wealth. Material Wealth – Tom uses the example of Nordstrom's and their legendary guarantee that allow customer's to return the product at any time for a full refund. The he asks the following question, "How might your business take on the buyer's risk to strengthen credibility?" What other ways, beyond a liberal return policy, you have seen that build credibility? Is there a line, when it comes to this currency, that a company can not afford to cross? How many opportunities have we missed because we were too busy and didn't "engage" someone? How many sales have been lost because we didn't just answer the phone? How many new clients slipped through the cracks because we didn't answer an email or didn't answer it soon enough? Over the past couple of years I've been doing some straw polling of friends and business partners when it comes to "engaging". What I've discovered is that the vast majority of company's are seemingly too busy to engage their current customers let alone new, potential, customers. I have heard over and over from people – my customers and others – that we got the business or they got the business just because someone picked up the phone and talked to me. 6. Invest in Community: Local businesses are owned by people who live in the community and are less likely to leave, investing in the community's future. 7. Put Your Taxes to Good Use: Local businesses in town centers require less infrastructure investment and make more efficient use of public services compared to nationally owned stores. 8. Conserve Your Tax Dollars: Shopping local business allows more money to beautify your community. 9. Invest in Entrepreneurship: Creativity and entrepreneurship is what the American economy is founded upon. Nurturing local business ensures strong community. 10. Make Us a Destination: Making our community more unique and interesting attracts new neighbors and visitors. This benefits everyone! A couple of weeks ago I was in Atlanta and had the opportunity to visit a number of retailers who do business with the company I work for. One of our last visits was with a small retailer in Loganville, GA – just north of ATL. They shared with me a flier they hand out to all of their customers about the benefits of buying local. The sheet doesn't have copyright information on it and the store owners don't know where they got it so my apologies if you wrote it and aren't getting credit. 1. Keep money in local community: For every $100.00 spent locally, $68.00 stays in our community. 2. Keep our community unique: One-of-a-kind businesses are an integral part of our distinctive character leading to the benefits of tourism. 3. Create local jobs: small local businesses are the largest employer nationally and in our community. 4. Reduce environmental impact: locally owned business make more local purchases requiring less transportation, contribute less to urban sprawl, congestion, habitat loss and pollution. 5. Get better service: local businesses generally hire people with better understanding of their product and more time to get to know the customer. What are your thoughts? Does it matter if we buy local? Earlier this evening I was reviewing my file of saved quotes and came across this one from Andy Wibbels. He said, "Show your passion for helping your customers solve problems – and talk to them like you talk to your friends. A real, enthusiastic, human voice is every small business's edge"
This is a great reminder from Andy. With so many different things competing for our time and energy, it's easy to become robotic in our responses to our customers. Keep your human voice strong and your business edge sharp. What is one thing you do to maintain your enthusiasm for what you do? Steve Rubel has some great conversation on the continuing hot topic of email vs. social network platforms and the future of email. If you need something with staying power – something that will last more than a few seconds then email is still the tool of choice. Email is still the work-horse when it comes to driving sales effectively. I absolutely believe in and see the power of multiple social network platforms (I'm here participating in one) but if shelf-life is what you are looking and what you need then nothing beats email.